The families gave the Trump admin a list of Iranians in the U.S. alleged to be children or relatives of top Iran officials, including President Rouhani. WASHINGTON — Families of Americans detained in Iran have urged the Trump administration to deny U.S. visas to the children of top-ranking officials in the Iranian government, but the White House has yet to take action, two sources close to the families told NBC News. The families of the imprisoned Americans see the administration's response to their request as part of a broader failure to place a top priority on securing the release of their loved ones, despite a campaign promise from the president to resolve the issue, two family friends and two congressional aides told NBC News. Nadim Zakka, whose father Nizar, a U.S. legal resident, was invited in 2015 to take part in a conference on the internet in Iran and was then imprisoned, said revoking visas of Iranian officials and their families "is the minimum the United States Government can do to stop this trend of hostage-taking that has been happening for 40 years." Added Zakka, "They need to pay the price on a personal basis so that they would know that each action will affect them personally." "I'm at a loss why this administration would be so soft on the regime knowing full well it is these very senior officials targeting innocent Americans for persecution," said a friend close to one of the families. "Surely the least we could do is deny their family members the benefits of living and working in our great country." Two sources in the Iranian-American community told NBC News that the list is accurate in identifying relatives of senior figures in Iran's government. Among those named is the son of Masumeh Ebetekar, who rose to fame as the unapologetic spokeswoman for the student protesters who seized the U.S. embassy in 1979 and took 52 Americans hostage for 444 days. She is currently a vice president for family and women's affairs in the Iranian government. According to his social media profile, her son is a student in Los Angeles. Hashemi's presence in California has been reported previously by Radio Free Europe and other media. Chinese-American graduate student Xiyue Wang (left), who is serving a 10-year prison sentence in Iran. 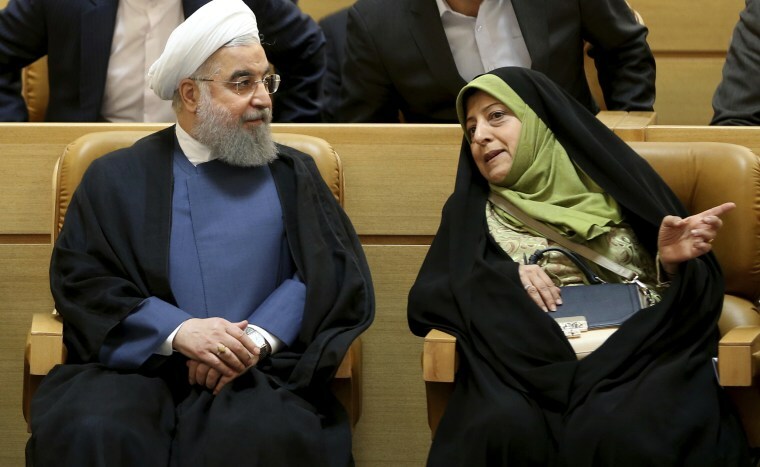 The daughter of the powerful speaker of the Iranian parliament, Ali Larijani, is also on the list. She is a resident in internal medicine at an Ohio hospital, according to medical directories. The nephew of President Hassan Rouhani attended college in New York City and now works there, according to LinkedIn. The nephew's father was the former top adviser to Rouhani, who stepped down after coming under fire from hardline opponents of the Iranian president. Friends of the families of Americans detained in Iran say visas issued to children of prominent Iranian officials should come under closer review and be used as a potential point of leverage, as it has with other foreign governments. "We are giving carte blanche to Iranian officials and family members to study and to travel here," said another family friend. "We should be scrutinizing them a little closer." Asked about the option of canceling or threatening to cancel U.S. visas for relatives of Iranian officials, a State Department official said: "The United States is pursuing all options for pressing the Iranian regime to end their arbitrary detention of U.S. persons and will continue to press Iran on these cases until they are resolved." The official, who was not authorized to be quoted by name, added, "I cannot provide any detail of our private diplomatic discussions or internal policy deliberations." A number of lawmakers from both parties support the idea, including Republican Sen. Ted Cruz of Texas, and Democratic Rep. Eliot Engel of New York, expected to be the next chairman of the House Foreign Affairs Committee, congressional aides said. Engel "supports whatever leverage we have to get the Americans out," said one staffer who spoke on condition of anonymity. "The administration should make it clear to the ayatollahs that they'll get no gain and face-crushing pressure from holding American hostages. If that's not clear yet then more needs to be done," said Maria Jeffrey, a spokesperson for Cruz. "There are very few things the next Congress is going to agree on, but even most House Democrats understand it's catastrophic to let Iran keep holding American hostages without consequences," said a senior congressional Republican staffer, who asked not to be named. In April, the House passed a bill, the Iran Human Rights and Hostage-Taking Accountability Act, that would impose sanctions on Iranian officials deemed responsible for the detention of Americans and other foreign nationals. It also proposed imposing sanctions on family members of those Iranian officials. Earlier this year, Cruz co-sponsored a similar resolution called the "Iran Hostage Act" that proposed prohibiting visas to the families of Iranian officials who detain Americans. As a candidate, Donald Trump vowed in a tweet that he would not allow U.S. citizens to be imprisoned in Iran and his administration's tough talk had initially raised the hopes of relatives of Americans languishing in jails in Iran. But those hopes have given way to disappointment. Since Trump was inaugurated, his administration has had some success in other countries, securing the release of Americans held in North Korea, Egypt, Turkey and Venezuela. But another American has been imprisoned in Iran this year, Morad Tahbaz, who was detained in January 2018 along with other environmental activists. The families said they have had too many officials assigned as the lead contact for their cases over the past two years, forcing them to virtually start from scratch every few months. "You can't have a half dozen or more interlocutors and have a sustained and strategic approach to gaining the release of American hostages," said a family friend. "It's literally impossible." The State Department official said the president earlier this year named a special envoy for hostage affairs, Robert O'Brien, "to coordinate a diplomatic approach on these and other cases." The position, along with a hostage recovery team, was created under the Obama administration. As the Trump administration in recent months weighed whether to issue waivers to some countries to allow them to purchase Iranian oil without running afoul of U.S. sanctions, some families and their lawyers proposed to the White House to link the waivers to the release of detained Americans. Some U.S. officials appeared open to the idea but in the end the administration chose not to link the two issues, family friends said. "The United States has a no-concessions policy and the president has made clear that we will not pay ransom for hostages," the State Department official said when asked about the proposal. Qu Hua, whose husband, Princeton doctoral student Xiyue Wang, has been held in Iran since August 2016, said the administration needs to craft a strategy on how to win the release of her spouse and others in prison. "I think the sticking point in this entire situation is the lack of a policy on how to cope with this case. They still lack a policy," she told NBC News. Her husband was in Iran conducting research in Iranian political history from the early 1900s when he was detained and eventually charged with espionage. His son was two years old at the time. Hua, who said she is not lobbying for revoking visas of Iranian officials' relatives, also said the administration needed to pursue a dialogue with Iran separate from other disputes that would focus on the cases of Americans held in Iran. Apart from Xiyue Wang, Morad Tahbaz and legal resident Nizar Zakka, two other Americans are imprisoned in Iran: Siamak Namazi , who has been held since October 2015, and his father, Baquer Namazi, who was detained in February 2016. The family has said 82-year-old Baquer Namazi is in fragile health and could die in custody. Iran's foreign minister, Mohammad Zarif, has said publicly his government would be open to a dialogue solely on humanitarian issues to review the cases of detained Americans. At the Council on Foreign Relations in April, Zarif countered questions about detained Americans by citing cases of Iranians detained in the U.S., but also mentioned the possibility of prisoner exchange. "Without a consular dialogue and real engagement I don't see how this can be resolved," Hua said. "I think they need to do that very soon. What are they waiting for?" At different times, both the U.S. and Iran have expressed a willingness to open a dialogue on the cases but the two have yet to come to agree on starting the discussions, said a former senior U.S. official, who spoke on condition of anonymity. Hua and other relatives of detained Americans have endured a cycle of hope and despair as they have sought to draw public attention to the plight of their loved ones. "I am really struggling to get this story heard and keep it in the public eye," she said. "To me this is a silent crisis." Apart from U.S. citizens or legal residents held in Iran, there are an unknown number of European-Iranians who are behind bars in Iran. A recent report by the Thomson Reuters Foundation said more than a dozen dual-nationals from Europe are under detention in Iran. On Monday, several American and European families with relatives imprisoned in Iran issued an open letter to world leaders and the UN, demanding urgent action and accusing Iran of taking "hostages." "The evidence is conclusive, and we should call this what it is: hostage taking," the letter said, adding that Tehran uses the detainees as bargaining chips. The Iranian government has rejected accusations it is taking hostages and said that those imprisoned were legally charged and convicted by the country's judiciary. Iran's mission to the United Nations did not respond to requests for comment. "We believe that the Iranian authorities have little incentive to end the cruel and horrific practice of hostage taking as a result of inadequate pressure from the international community," said the letter from the families. "World leaders need to make the political cost for committing human rights violations so high that releasing our loved ones becomes advantageous to the Iranian authorities." The Iranian government did not respond to requests for comment.